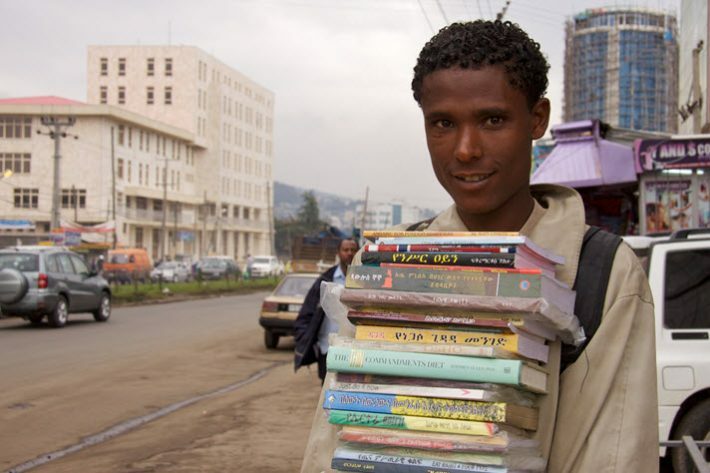 Bookselling is curbside in Ethiopia’s largest city, where vendors on foot offer titles to passersby. Workayehu says that the credit for this observed increase in reading availability goes to the city’s mobile book vendors of Addis Ababa. These street vendors, Workayehu reports, roam the streets of Ethiopia’s capital carrying books piled “up to their necks.” He estimates that there may be as many as 1,000 of these vendors on the streets. And where do the vendors get the books they sell? Although Ethiopia is reported to have imported US$11.2 million worth of books in 2015, many of the books that vendors sell are published and distributed locally. Artistic Printing Press is mentioned as one of the leading houses, active for more than 70 years. Overall interest in categories lies in textbooks, reportedly, but a demand for fiction and nonfiction titles is also said to be on the rise in this country of 93 million people with no VAT levied on books. Of course it’s not always smooth sailing: the cost of printing has risen due to increased cost of materials and labor, Workayehu reports, and since some supplies, such as paper and ink are imported, the foreign exchange rate has impacted operations. The full report from Mahlet Workayehu for Addis Fortune at AllAfrica is here.